Jewish identity politics complicate the Palestinian response to the existence of Israel as a Jewish state. Sometimes it seems impossible to address the crux of the matter, the Jewish state Nakba in Palestine, without being subjected to attacks one way or another. On the last day of 2017, I posted a meme on my Facebook wall that provoked a long and heated argument. 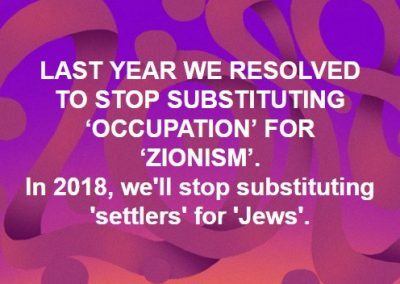 LAST YEAR WE RESOLVED TO STOP SUBSTITUTING ‘OCCUPATION’ FOR ‘ZIONISM’. In 2018, we’ll stop substituting ‘settlers’ for ‘Jews’. The year 2017 saw activist groups like Jewish Voice for Peace (JVP) and the US Campaign against the Occupation (now named the US Campaign for Palestinian Rights) make a shift in the tactics they used. They explicitly adopted all the goals of the Boycott, Divestment and Sanctions (BDS) Movement. Ending Israel’s occupation and colonization of all Arab lands and dismantling the Wall; recognizing the fundamental rights of the Arab-Palestinian citizens of Israel to full equality; respecting, protecting and promoting the rights of Palestinian refugees to return to their homes and properties as stipulated in UN Resolution 194. In practical terms, and regardless of the political arrangement required to implement these goals (one state or two), complying with international law regarding BDS goals means dismantling Zionism — i.e. dismantling Israel as a Jewish state. However, the nature of Israel as a Jewish state is still being “contested” (for lack of a better word), as if concepts such as ethnicity and religious difference are still determining factors in people’s lives today and not a matter of choices, but of essences. Standing in the way of the achievement of BDS goals, among a host of other challenges, is Jewish identity politics. Jewish identity politics (especially in the US) includes the secular strand that marginalizes Zionist Jewish thought as “not really Jewish” — as though Zionism is not rooted in the Jewish religious idea of exile and return — and the religious strand (the Judaic rather than Jewish strand) that outlaws the Zionist notion of “return” for not being coupled with the coming of the messiah. However, both these strands of Jewish identity representation account for a tiny minority of Jews worldwide. Most Jews support the racist, Apartheid Jewish state and its so-called “right” to exist as such. Millions of religious and secular Jews continue to define themselves the way Israel identifies them. And, more importantly, most states in the world also continue to identify Jews as Israel identifies them. It is only relatively recently, because of anxiety that the illegal residency of Jews in East Jerusalem and the West Bank (i.e. the march toward one democratic state) would topple the shaky foundation on which the Jewish state rests, that “settlers” in the West Bank among immigrant Jews to Israel have been singled out for criticism, albeit mild, in the mainstream media. I believe strongly that it is important to address the nature of Israel as a Jewish state without obfuscation, because the beginning of Palestinian self-determination is the end of Israel as a Jewish state. Without that end, there is not ever going to be a beginning for us. Zionism is not run-of-the-mill settler-colonialism. Had this been the case, Palestine would by now have liberated itself, as so many colonial states already have (Interestingly, as of 2012, 16 territories are deemed still to be under colonial rule and are labeled by the United Nations as “non-self-governing territories — NSGTs) — the Palestinian territory is not on the list). It is certainly not for lack of courage, steadfastness or resolve that Palestinians continue to have a boot over their necks almost 70 years after the Nakba. In having to battle a Jewish state, Palestinians are up against a formidable foe — not only because of the considerable achievements of Jews on the world stage in almost every field of endeavor, but also because of the persecution Jews have historically experienced and Western guilt associated with that tragic history. Another huge obstacle for us has been Zionist propaganda which has penetrated thousands of synagogues worldwide, complicating the distinctions between Judaic and Jewish. Zionism in Palestine has been slowly but surely turning into a religious conflict. There is no doubt that among Palestinians themselves today, the strongest force driving Palestinian self-determination is Islam. We cannot and must not pretend the religious side of the struggle for liberation is nonexistent — Jew against Muslim and vice versa; Christian against Jew and Evangelical Christian for Jew. So, what do we do? I think the first order of business is finding clarity in what has become a morass of myths, half-truths and deflections — we must open the door for discussing and understanding the complicated issue of Jewish identity as it has emerged in the 20th and 21st centuries.